Carillon's new TI series sees them incorporating affordable, no-nonsense music PCs into their familiar rackmount cases. Over the last few years Carillon have earned themselves an enviable reputation for build quality and their eye-catching rackmount case. Described as a "breakthrough in personal audio computing", Carillon's new TI systems are about 'Total Integration', combining hardware and software in a way specifically designed to suit musicians moving over to computer-based music production for the first time, or those who already use computers but want an optimised 'off-the-peg' audio machine. There are two systems: the TI, at £799, and the TI Plus — under review here — at £1099, differing in their choice of processor, hard drives, optical drive and cooling arrangements, but otherwise identical. They both feature a custom desktop interface to make life easier for those new to Windows, and also include custom audio hardware providing a mic, guitar and line preamp, headphone amp, eight-knob MIDI controller, and transport controls to supplement the system's Emu 0404 soundcard. Carillon also include one of the biggest software packages I've seen, plus video manuals and tutorials, their own Fix software, so an engineer can dial into your computer using the supplied 56k modem (in the hopefully unlikely event of anything going wrong), plus Ultralink software, designed so that a teacher can interact with or broadcast a lesson to students over a network of TI computers. Overall, it's an ambitious hardware and software package designed to provide a complete 'out of the box' system. Let's see how it shapes up. Inside Carillon's familiar AC1 rackmount chassis (now enhanced with a handy, front-panel Neutrik USB connector), this system is based around an Asrock motherboard. Some years back, Asrock were often simply dismissed as the budget subsidiary of Asus, but recently they've gained a reputation for rock-solid stability at low prices. Nevertheless, to provide a software bundle as big as the one included here, yet still keep the overall system price in line with competing entry-level systems, some corners have to be cut. So this Micro ATX motherboard has an integrated graphics chip sharing 8MB of the system RAM rather than a separate AGP card (although there is a suitable expansion slot, should you want to fit one), only two RAM slots, and just three PCI slots. The TI Plus review model was fitted with a 3GHz Intel Prescott CPU, 1GB RAM, twin Seagate SATA hard drives — an 80GB model for system duties and a 200GB one for audio — and an NEC DVD writer. 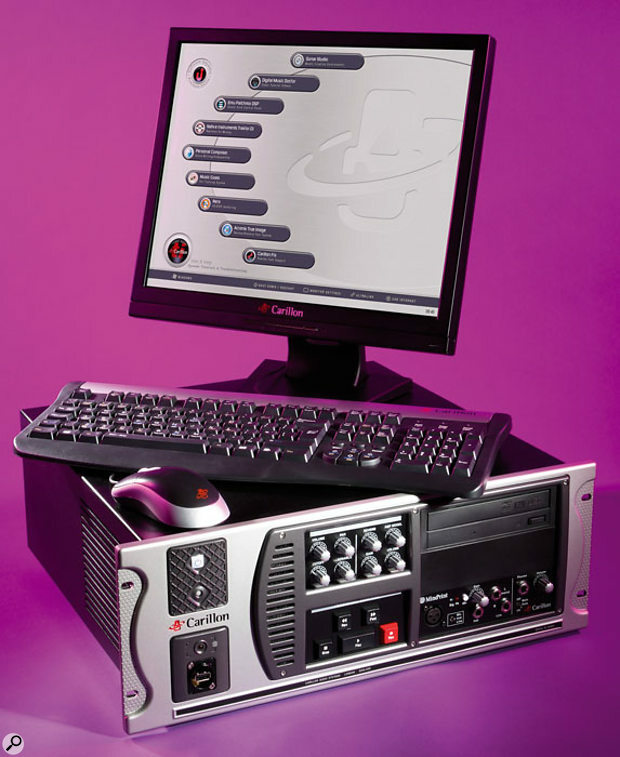 Meanwhile, the cheaper TI basic system features a Celeron-D 2.66GHz processor, 512MB RAM, a single 80GB Seagate hard drive and a DVD-ROM drive. Both models have 320W Carillon Ultramute PSUs and Arctic Cooling Freezer 7 Pro heatsink/coolers for the CPUs. Although neither of these would get power users salivating (there are other Carillon systems to tempt them), both systems should nevertheless provide quite enough 'welly' to run loads of audio tracks, plug-ins and soft synths. The big difference with Carillon's TI range is the extra hardware and software. Case: Carillon AC1 19-inch rack chassis with Neutrik USB front-panel connection. Motherboard: Asrock 775I65GV with one Socket LGA775 for Intel Pentium 4/Celeron processors including dual-core Pentium D and Extreme Edition models, Intel 865GV chipset, two DIMM sockets supporting up to 2GB of system memory, three PCI slots and one AGP 8x/4x graphics slot. 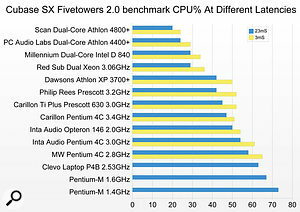 Processor: Intel Pentium 4 630 Prescott single-core processor with 3GHz clock speed and 2MB cache. 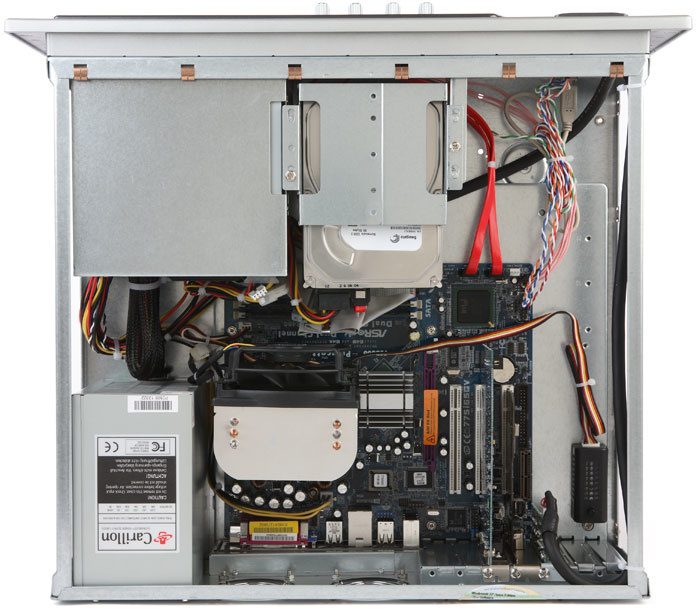 CPU heatsink and fan: Arctic Cooling Freezer 7 Pro with integral, variable-speed fan. System RAM: two 512MB sticks of PC3200 DDR-SDRAM with 2-2-2-6 timing. System drive: Seagate ST380811AS, 80GB, 7200rpm, SATA, 8MB buffer. Audio Drive: Seagate ST3200822AS, 200GB, 7200rpm, SATA, 8MB buffer. Graphics Card: Intel 82865G Integrated Graphics Device on motherboard. Optical Drive: NEC ND4570A 16x Dual Layer DVD+/-RW. Active System Ports: PS/2 mouse and keyboard, seven USB 2.0 ports, two Firewire 400 ports, parallel port, Gigabit ethernet port. Audio Hardware: Emu 0404 soundcard, Carillon RK8 eight-knob MIDI controller, Carillon RTM2 Transport controller, Carillon/Mindprint front end with mic, instrument and line inputs, and headphone amp. Installed Operating System: Windows XP Home Edition with Service Pack 2. As standard, both systems come fitted with an Emu 0404 soundcard, partly because its DSP effects help with CPU overhead, although you can choose other Emu audio interfaces if you prefer. The unique parts of the hardware package are the three units integrated into the rackmount case's front panel. The RTM2 panel provides a dedicated set of transport controls to use with your sequencer, while the RK8 provides eight assignable rotary MIDI controller pots. Photo: Mike CameronThe third hardware add-on is the new Carillon/Mindprint HP Pre, a collaboration with the German manufacturer responsible for lots of well-respected mic preamps and channel strips. It fits into a standard 5.25-inch drive bay and provides a preamp, headphone amp and output controls. It has a Class-A mic preamp with balanced input and 48V phantom power, high-impedance quarter-inch jack instrument input, gain control, twin line-level quarter-inch jack inputs, a three-way input selector switch, and signal and peak level indicators. Along with Carillon's custom keyboard with pre-printed Sonar shortcuts (also available for Cubase and Pro Tools) and the Carillon mouse, the whole package looks most attractive, and you can buy a matching LCD monitor if you wish to complete the image, or, of course, use your existing one. Carillon have always been keen to keep acoustic noise levels to a minimum, and the TI Plus proved to be pretty quiet, although you would still pick up a little noise on a mic in the same room, unless you were careful. During stress testing, the CPU and hard drive temperatures all stayed below a safe 50 degrees Centigrade, while acoustic noise levels didn't rise unduly. Photo: Mike CameronOnce the TI Plus completes the boot process you soon realise the trouble Carillon have taken to shield new users from the potential confusion of the Windows desktop. They've installed their own Talisman Desktop design (find out more from Lighttek Software at www.lighttek.com/talisman.htm) that provides nine dedicated button bars to launch the bundled applications and Emu's Patchmix DSP utility, plus two further circular buttons that access on-line software upgrades at the Carillon web site and the 'How & Help' system tutorials and troubleshooting guides. System overheads for this custom front-end seem small (only about 9MB of system RAM and no discernible CPU overhead), and for those unused to Windows, this is a far more user-friendly welcome. Users can switch to the standard desktop at any time, so they can get on with more mundane activities like word processing, but for educational use you can apparently password-protect such access to prevent tampering with system settings. That should put smiles on some faces! The choice of main applications covers the majority of musical activities, but having them all so carefully set up and integrated into one reliable box will be very reassuring to many new users. Carillon have obviously used their close relationships with various developers to cut a good deal on this bundle, and you do get a lot for your money. Emu Emulator X sampler with Virtuoso X, Vintage X Pro Vol 1, Mophatt X and Planet Earth X libraries. Cakewalk Sonar 4 Studio Edition sequencer. Digital Music Doctor Sonar Training videos. Native Instruments Traktor DJ Studio, Xpress B4, XPress Pro 53 and XPress FM7. Personal Composer 16 v1.9, supporting up to 16-stave scores. Rayzoon Jamstix Virtual Drummer SE. Music Goals Ear Training Software. Akai Decca Buddy, DC Vocoder, Pitch Right, Rotator and Quad Comp plug-ins. Acronis True Image Backup, Nero CD, Power DVD software. Carillon Fix and Ultralink remote dial-up and teacher/student network software. Six Sample Lab sample CDs. To keep the overall system price this low, the version of Sonar Studio will always be one version behind the latest. So my review system featured Sonar 4 Studio Edition, while version 5 will be bundled by the time you read this, as Sonar 6 should be shipping. However, you can upgrade any TI system to Sonar 6 or Cubase SL 3 at extra cost if you prefer these applications. Fortunately, the BIOS and Windows had both been set up to maximise performance, and the only unusual setting I noted was that System Restore was still enabled (most companies disable this to remove its extra overhead, but for a beginners' system it is perhaps a sensible precaution). Bearing in mind that the TI Plus is an entry-level PC, it performed roughly as I would have expected. Both system and audio drives provided sustained transfer speeds that were just as fast as any other machine with these Seagate models, at just over 60MB/second, so you ought to be able to run 60 or 70 tracks of 24-bit/96kHz audio, and even more at the more typical 24-bit/44.1kHz. These track counts are way beyond the requirements of most musicians. So far, so good. With a performance similar to cutting-edge PCs of early 2005, Carillon's TI Plus system provides enough processing clout to run plenty of audio tracks, plug-ins, and soft synths -- without breaking the bank.Photo: Mike CameronRunning my 'Fivetowers 2' tests for continuity with a range of older machines, I found that the TI Plus' Prescott 630 3GHz was slightly faster than Carillon's own Pentium 4C 3.4GHz machine reviewed in SOS in September 2004, and just behind the Philip Rees Prescott 3.2GHz PC reviewed in SOS in January 2005. I also ran the 'Thonex' benchmark test that includes no audio tracks, but instead uses 14 soft synths and 50 plug-ins, to give you an idea of how the TI Plus compares with the latest dual-core systems, and it managed to run the test down to 12ms latency before starting to glitch. This proves that Carillon have got their sums right in designing a PC that, although not state of the art, can still run loads of instruments and effects. You are only likely to need a more powerful PC if you want to run this amount of tracks, plug-ins and soft synths at latencies of 6ms and below, which is where the latest dual-core models come in. In fact, after I noticed that the current TI motherboard also supports Pentium D dual-core processors, Carillon told me that a TI Ultra system with dual-core processor is likely in the near future for just such users. I could nitpick and say that instead of relying on the motherboard graphics chip and having it sharing system RAM, just another £40 would get you a dedicated AGP graphics card fitted, or that spending significantly more on a more up-market dual-core system would give you a computer with a longer 'shelf life'. However, the TI range has been carefully designed to do a specific job, and it does that job well. Any range that's aimed at the beginner or student needs exceptional technical support, and Carillon already have a good reputation in this area. They have a free Tech Support line manned by experienced staff, while their Fix software, used in conjunction with the supplied 56k dial-up modem, can let one of their technicians dial into your PC to fault-find, should this be required. A new feature in the TI package is the Ultralink Teacher/Student network utility, a Windows application that operates in either Control or Host mode. In Control mode, a teacher can connect over a network to remote PCs that are operating in Host mode, see what's on their screens, and operate them remotely using keyboard or mouse commands. There's also a chatbox so that text messages can be typed in at both ends, an annotation mode that lets both parties 'draw' on the screen to highlight something, and the teacher can even speak to the students on the host machine's soundcard, via a mic on the control PC. This is a powerful tool for those who want to run the TI on an educational network. This is a tricky computer to sum up, as it's the first I've ever reviewed that's not concentrated on going as fast as possible for the price. 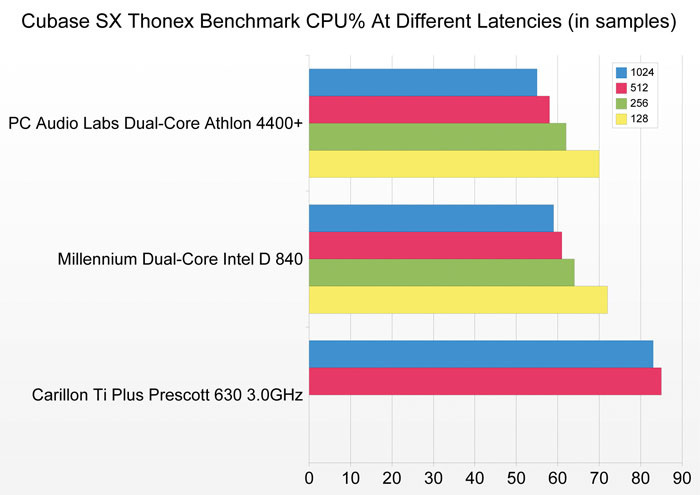 As such, this isn't a system designed for the PC enthusiast, who is far more likely to be interested in an Athlon X2 or Intel Conroe processor with even faster system performance, along with a cheap AGP card instead of a motherboard graphics chip, and who will be able to personally choose the most suitable software. Carillon's TI Plus is quite capable of running the punishing 'Thonex' benchmark down to latencies of 12ms, and only if you think you'll need to run more plug-ins and soft synths (or lower latency) would you need to consider a more powerful PC.Photo: Mike CameronInstead, the Carillon TI range was designed to "redefine standards of integration, useability and value for money", and this it certainly achieves, especially as the software bundle alone is claimed to be worth well over £1000. This bundle should appeal to many who are starting from scratch with PC music-making, and quite a few schools, who will find the range of software valuable for a wide variety of teaching purposes. Meanwhile, the PC itself is quite powerful enough to run complex songs created entirely with soft synths, if that's what you want. The hardware combination of Carillon's rugged yet quiet rackmount case plus an Emu soundcard with Mindprint preamp front-end, transport controls, MIDI controllers and headphone amp is also very enticing, and those who want everything in one neat package are likely to find the TI Plus an attractive proposition. On the other hand, there are plenty of musicians who won't be interested in scoring or ear-training programs, or who might prefer an entirely different suite of software. Many other specialist music retailers also have dedicated educational departments that can discuss requirements in detail with schools and colleges, so it would be quite possible for such retailers to put together a similarly functioning package. Where Carillon have always scored as a company is in making their choices straightforward and reassuring, and the TI range continues this approach for schools, newbies and entry-level users by offering just two standard systems, which avoids so many potentially confusing and often conflicting 'what do I really need' discussions with various suppliers. Ultimately, the Carillon TI Plus system performs as advertised, includes all the hardware its target users are likely to need, in one professional-looking box, and includes almost more software than you can shake a stick at, yet costs just £1099. Only customers can really decide whether this is the perfect system for them, but I suspect that Carillon have got it right for quite a few people. Elegant rackmount case with front-panel preamps and controllers. Huge amount of software for the price. Reassuringly simple choice of just two standard systems for the newcomer. Still some upgrade options, despite the use of hardware that's not cutting-edge. 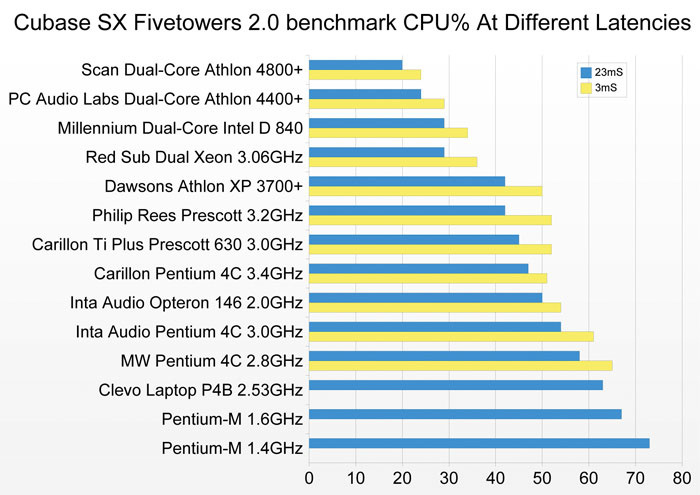 Significantly less powerful than modern dual-core systems. The software bundle may not suit everyone. Carillon's TI Plus is an unusual PC system that focuses on what most entry-level musicians actually need, rather than what they think they ought to buy, and combines a comprehensive software bundle with a sensibly thought-out hardware specification. TI Plus system, as reviewed, £1099; basic TI system £799; Carillon 19-inch LCD monitor £180; Carillon 17-inch LCD monitor £140. Prices include VAT. Carillon +44 (0)20 7692 7629.